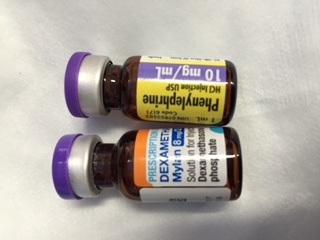 I have concerns about the similarity between the vials of 8mg dexamethasone and 10mg of phenylephrine at Pindara. As per the photo they are both in tinted vials with purple caps and bright and fairly similar labels. In the anaesthesia trolley they are in close proximity as per the second photo. The amount of phenylephrine in the vial if given neat is about 100 times what a bolus dose would be. The whole vial of dexamethasone is frequently given as a push, as you know. Syringe swaps with phenylephrine are strongly represented in case reports on this issue and are associated with deaths. I understand that the pharmacy at Pindara has a different form of phenylephrine and I have got the similar vials replaced. 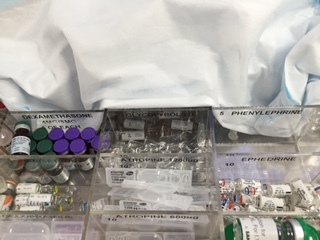 It does raise the issue of whether drugs that predictably would result in death in the case of a syringe swap should be stored in some different manner to the rest of our drugs. The growing importance of AnSafe on the Gold Coast has necessitated a reorganisation of the email lists used for communication. The growth of lists has been a little haphazard, some people are on multiple lists, some on none, and audiences are being refined and redefined. Please bear with us over the next few weeks as these things are sorted out.